Greetings friends and fellow crafters, LeeAnn here with my post this week for White Rose Crafts. I have never attempted decoupage in the past and thought it would be fun to try. We are entering the birthday season in the family (including my own in less than 2 weeks) so lets see how fun and easy it was. Using a page of Anita's Decoupage I punched out the images for this adorable scene. There were several pieces of this set that was so easy to put together. Using foam dimensionals I layered each piece to make this scene. Then for the background I used Distress Oxides in Shaded Lilac and Tattered Rose on Bristol paper. 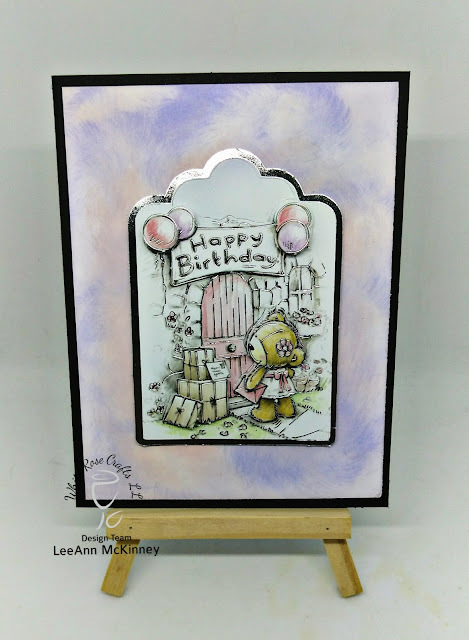 I layered this on an A2 card base of black cardstock. Used foam tape to add the decoupage piece and my project was complete. Would you like to try Decoupage yourself? I tell ya, this is the easiest way to make card I have found, and there will be more in the future. I have been given a code for you to use until Midnight EST 4/7/18. The code is EASY CARDS, 20% off all products in this category (Die Cuts Decoupage).